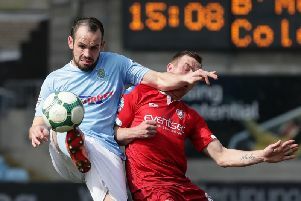 Ballymena United manager Glenn Ferguson was critical of his team's performance in the defeat at Warrenpoint. Picture: Press Eye. Glenn Ferguson was critical of the attitude of his Ballymena United players in the New Year’s Day loss at Warrenpoint Town. The Showgrounds boss felt some of his players “lacked mental toughness” as their three-game winning streak came to an end at Milltown. “We had a couple of half chances but Warrenpoint had more chances than us,” said Ferguson. “The way the game was going, it looked like it was going to pan out a dour 0-0 draw because they were missing chances and we missed a couple but then I think the referee had had a howler giving them the penalty. “I don’t think it was ever a penalty, never in a month of Sundays. That gave the impetus to push on and we had to change our shape to try and get something out of the game. We were caught again on the counter attack and the linesman has made a mistake because the guy was offside. “But those two decisions didn’t make us lose the game. The way we played and the way we went about our business was all wrong. “Warrenpoint deserved to win. When it’s 0-0 and things aren’t going your way, you hope to get a point out of it but then two big decisions go against. “It’s a lack of consistency and a lack of mental toughness in some of our players. “When things aren’t going your way, you look for leaders and for people to take a grip of the game. We didn’t have any of that. “It’s very easy to lift your game for Boxing Day against Coleraine, your local rivals, and give everything you have in that game. “Every footballer should go out in every game and give everything they have to try and win a game of football. On Boxing Day we did that, at Warrenpoint we didn’t and we paid the price. “No disrespect to Warrenpoint, but they are a team who I believe we should be beating and to play the way we did and just expect it to happen, it doesn’t work like that. “You have to earn the right to win matches in this league and today we didn’t do that. “But we have to take it on the chin and get a squad together for Saturday against Glenavon. “With all due respect, Glenavon are a better side than Warrenpoint, they have better players on their day and if we play like that then the scoreline could be a lot more than 2-0,” said Ferguson, who hopes to have striker Gary McCutcheon available to make his second debut following his transfer from Crusaders. “I’m hoping that we can get it pushed through. “Gary is a good footballer. He’s got class, he’s intelligent on the ball so if we can more players like that into the team then we will create more chances. There’s no doubt about that,” added Ferguson.